The Summer 2018 issue of 'Teaching Geography' is now available to download by subscribers, and the hard copies will be coming shortly into schools if they haven't already. There is plenty of interest in this issue, with plenty of articles by friends, and some very useful additional online resources. A great Ben Hennig cartogram on the cover, including an article inside too on the relaunch of Worldmapper. Darren Bailey talks about the tools in Digimap for Schools. 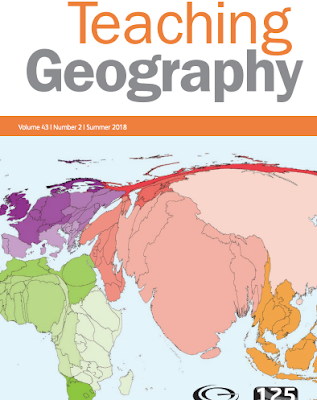 There's an excellent article on Place from Eleanor Rawling, and Aiden Hesslewood (one of this year's RGS-IBG Ordnance Survey Award winners) talks about planning for teaching Global Governance in the new 'A' level specifications. There's a look at BRITICE project I've blogged about elsewhere, and Fred Martin finishes with a look at how geography teaching has been influenced by a range of external factors, including the positive influence of the Action Plan for Geography and a mention for Guerrilla Geography and Mission:Explore work. Another excellent issue edited by Mel Norman. If you don't currently take this journal, you can add it to your GA subscription and then access back issues of all previous issues.